We hadn’t been hiking for a while. We chose Schiehallion, the ‘fairy hill’. It had been a while since I’d seen them. My first time here the fairies stole our water bottles. We found out half-way up, the hottest day of the year and the swines had hidden them in the boot of the car. Their laughter was like tinkling scree. My father and I were left with only an orange, plucked from a rucksack like a glorious gift; an orange for a pair of plums. The question immediately arose about when to eat the orange. To do so at 500m would be a serious mistake. This would also be the case, my father argued, if we rewarded ourselves when we hit the ridge. Having climbed the mountain before, he knew that the ridge of Schiehallion goes on for at least a hundred miles. To eat an orange before crossing that vast and sapping boulderscape would be to eat it terminally early. He is a man to listen to, well-versed in fairy duels and mountain-craft. He it was who once intoned, after I had staggered back to the car after getting lost in mist on Ben Cruachan, that it was likely a mistake to keep heading left as I went down, thereby looping myself in an elegant, if dopey, arc that eventually deposited me in an unknown glen on the other side of the mountain. We settled on the Eating of the Orange at the summit, by which point we were communicating in Cro-Magnon grunts, unable to form words in the absence of saliva. There would be no orange for the descent but that was fine- it wasn’t Seville’s finest now hovering in the mid-distance but Aberfeldy’s coldest, beer that is. 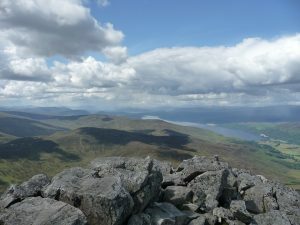 The second time I climbed Schiehallion my father demurred. He is a man of wisdom and great selflessness, and waited with his pale tootsies in Loch Rannoch to collect my wife and I when we got off the hill. Before we set off he presented us with an orange. This time the fairies stole our sandwiches. We found out later that they hid them in the glove compartment of the car. Corned beef and cheese sandwiches. 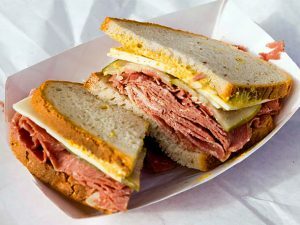 There is nothing like a corned beef and cheese sandwich while you shelter from the banshee winds of a Highland mountain. The only thing to improve it is an entree of pea and ham soup. My father’s wisdom, once more. And a corned beef and cheese sandwich is the three-course dinner of sandwiches, so substantial that it affects your judgement. I mean, there’s just no need for that big breakfast before the hike when you’ve got a corned beef and cheese sandwich to look forward to. Save your appetite! So we had. We found out about the fairy theft after we had rewarded ourselves for making the ridge by eating our only other food, a Tracker bar- the snack of choice for the serious hiker, a perfect balance of austerity and indulgence. Our remaining sustenance would be one Werther’s Original caramel, found in the frantic search through the rucksack’s fluff and dust. I placed it on a rock, where it gleamed with the gold of both promise and challenge. Because how do you split a granite-hard sweetie? There was no tiny saw on my Swiss Army knife and using the blade only succeeded in slicing off a precious sliver which immediately tumbled away on the wind. We could each sook a half. Paper, scissors and stone to decide who went first. The idea was jettisoned as being fraught with pitfalls. How could we efficiently check that the person going first had not oversooked, so greedy for the sugar that all that got handed over was the tiniest of lumps? The only fair thing to do was what any man should do. I declined the sook and offered the sweetie to my wife. She immediately popped it into her mouth, smiled at me with it clasped between her teeth and carried on walking. I could hear the fairies laughing in the scree again. I don’t know why they punish me like this, although my musings keep leading me back to the suspicion that I crapped in the wrong peat hag on the long walk in to Foinaven, once upon another blue day. I decided to seek the wisdom of my father. We found him sitting in the sun when we returned, famished, to the car park. He was just finishing a sandwich.